In PowerPoint 2007 or later: Save your presentation in the PowerPoint 97-2003 file format (.ppt). In PowerPoint 2003 or earlier: Install updates and converters to your PowerPoint version, which allow you to view the newer file format (.pptx). In PowerPoint 2013 or a newer version, open the presentation that you want to open using PowerPoint 97-2003. Click File > Save As and choose where you want to save the presentation. In the File name box, enter a name for your presentation, or accept the suggested file name. At Save as type, click PowerPoint Presentation, and select PowerPoint 97-2003 Presentation. The file is saved as a PowerPoint 97-2003 Presentation (.ppt) file that you can open in PowerPoint 97 through 2003. Notes: For more information about how to work with the different file formats, see Open a presentation created in a different version of PowerPoint. You can also Check whether a PowerPoint 2013 presentation can open with PowerPoint 2003 or earlier. No Save As is needed to use PowerPoint 2007 or PowerPoint 2010 to open files created in newer versions. The file format (.pptx) is already compatible with PowerPoint 2013 and newer versions. A presentation built in PowerPoint 2013 or newer versions might lose some features and effects when saved in PowerPoint 2003 or earlier. That's because those features or effects weren’t available in earlier PowerPoint versions. For information about features that might be lost, see PowerPoint features released in 2013 or newer versions behave differently in earlier versions. SmartArt graphics and some visual objects that are available in new PowerPoint versions are not in PowerPoint 97-2003. When you save as a PowerPoint 97-2003 file, graphic objects convert to bitmaps, which maintains their appearance but limits how they can be edited or changed. 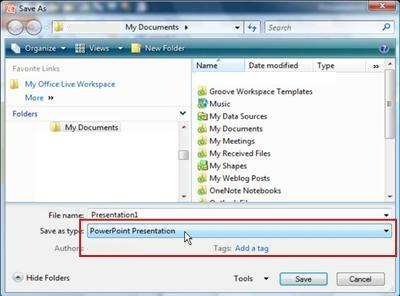 In PowerPoint 2010, open the presentation that you want to save as a PowerPoint 97-2003 file. Click the File > Save As. In the File name box, enter a name for your presentation, or do nothing to accept the suggested file name. In the Navigation bar, select the location that you want to save your presentation to, or do nothing to accept the suggested location. To the right of Save as type, click PowerPoint Presentation, and select PowerPoint 97-2003 Presentation. Important: PowerPoint 97-2003 does not recognize SmartArt graphics and newer visual objects that are available in PowerPoint 2010 and will convert them to bitmaps to maintain their appearance. You cannot change certain aspects of bitmaps, such as line width, fill color, and other PowerPoint 2010 specific properties. In Office PowerPoint 2007, open the presentation that you want to save as a PowerPoint 97-2003 file. Click the Microsoft Office Button button, point to the arrow next to Save As, and then click PowerPoint 97-2003 Presentation. In the Save in list, select the location that you want to save your presentation to, or do nothing to accept the suggested location. A presentation built in Office PowerPoint 2007 might lose some features and effects when saved in PowerPoint 2003 or earlier. That's because those features or effects weren’t available in earlier PowerPoint versions. PowerPoint 97-2003 does not recognize the new SmartArt graphics and visual objects that are available in Office PowerPoint 2007, and will convert them to bitmaps to maintain their appearance. You cannot change certain aspects of bitmaps, such as line width, fill color, and other Office PowerPoint 2007 specific properties.